Fourteen years ago, I picked up a copy of The Complete Four Sport Stadium Guide, a joint production of USA Today and Fodor’s that contained seating maps, travel tips, and other info about each of the stadia and arenas for the four major North American sports leagues. The book is horribly out of date by now, as you might imagine—by my count, 61 of the 111 profiled facilities are no longer in use for their intended purpose and another four have been so drastically remodeled as to be unrecognizable. So why do I keep the book around? Surely, the chapter on the Astrodome won’t help me the next time I want to catch a Houston Oilers game. Well, other than the nostalgia factor—$17 could get you a box seat at Yankee Stadium in 1994, kids—I always appreciated how The Complete Four Sport Stadium Guide was able to condense a lot of information in a tiny amount of space. Each entry is no longer than three pages at most, but just about everything you’d need to know—where to sit, how to get there, what to eat when you’re in the yard—is right there at your disposal. The Friendly Confines: You’ll find a wealth of information about Wrigley Field and the 29 other Major League stadiums in Baseball Road Trip, though critical data like seating and ticket info is missing. I have no idea if developer Heather Ward has ever seen The Complete Four Sport Stadium Guide. But she tries to pull off much the same feat with Baseball Road Trip, a mobile guide to all 30 Major League Baseball stadiums. It’s a noble effort that packs a lot of data into a $1 iPhone and iPod touch app, but one that ultimately suffers from muddled organization and critical stadium info that’s MIA. Baseball Road Trip is clearly aimed at two groups of people: travelers who arrive in a new city and wonder if there’s a ballgame nearby tonight or baseball fans who long to opt out of this crazy work-a-day world and spend the summer roaming from ballpark to ballpark. Or to put it another way, the app targets me and several of my very dear friends. Non-baseball fans will find very little to interest them here, just as they likely find very little joy in the rest of their lives. Launch the app, and you’ll see a scrollable list of 30 baseball teams, each accompanied by a spiffy picture of their home ballpark. Tapping the team name produces a detail screen listing the stadium, its address (linked to the Maps app), and a phone number that dials up the team’s office if you tap it. The app also lists when the stadium opened, its capactiy, and dimensions, and other fun facts. (Did you know the roof of the Hubert H. Humphrey Metrodome in Minneapolis is made of teflon and fiberglass and supported by air? You do now.) In addition to listing the 2009 schedule for each team—a lovely touch, by the way—Baseball Road Trip also notes restaurants, hotels, and attractions near the stadium (or at least, within shouting distance of the same municipality) to help plan your baseball-themed getaway. There are a couple of really nice additions to each park listing. A link lets you read coverage of the team in question from the local newspapers via Baseball Road Trip’s built-in browser. The app also lists the “signature” food item for each ballpark, so that you can be sure a visit to Dodger Stadium won’t go by without sampling a Dodger Dog. One quibble here: Baseball Road Trip should include location data if the food item in question is at a specific spot in the stadium. It’s all well and good to tell visitors to the Oakland Coliseum that they should try the ball tip sandwich at Kinder’s BBQ—and they should—but why doom those souls to wander around the dank bowels of the Coliseum when you can just as easily tell them that the BBQ stand is behind Section 104? 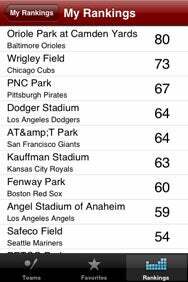 Rank and File: You can rank each stadium based on 10 criteria. These may be the only standings the Orioles find themselves at the top of for some time. While I’m quibbling, I have a small gripe about another otherwise clever feature in Baseball Road Trip. The app lets you rank stadiums in 10 different categories. It’s a fun little feature, but your rankings stay there on your iPhone. It would be nice if there were a way to upload them somewhere so you can see how your tastes compare to the world at large. Do other people share my love of Camden Yards and my general indifference toward Chase Field? I’d sort of like to know. Those are just minor criticisms, though. Baseball Road Trip has a couple of more serious issues that keep it from being an all-star app. One problem is the way the app displays all these stadium details—in one long, vertical list. That leads to a lot of scrolling. It seems like there might be a friendlier organizational scheme. More significant, Baseball Road Trip is missing a couple of key data points. If you want directions to a ballpark, you’ve got to jump to the Maps app, leaving Baseball Road Trip behind. That’s an acceptable approach, I suppose, but it seems like the app should provide some cursory How To Get There data—especially when it comes to public transit options. Nearly every MLB team Web site contains that information, so it wouldn’t be particularly hard to come by. The app is also missing the answers to the two most important questions baseball fans ask themselves when contemplating a trip to a strange, new yard: Where should I sit? And how much is this going to set me back? A seating chart with accompanying ticket prices seems like a must-have for this kind of app. While it would admittedly be no small feat to include 30 stadium charts in a single app, it still feels like a major omission from an otherwise thorough offering. I like Baseball Road Trip—I really do—and I think that most baseball fans will get some value out of it, provided they accept its limitations. But there’s plenty of room for this app to raise its game in future editions. 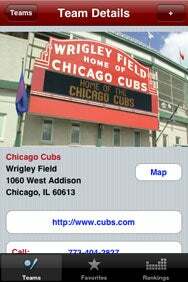 Baseball Road Trip is compatbile with any iPhone or iPod touch running the iPhone 2.2.1 software update.